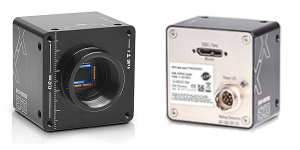 This USB3 Vision camera features the Sony IMX265 sensor to deliver 2048 x 1536 resolution at 55 frames per second. This USB3 Vision camera has two trigger inputs plus an optically-isolated input. There are four outputs. There is also an RS232 input (RXD) and output (TXD). Inputs use Schmitt triggers for better noise immunity. Both inputs and outputs support discrete 24 VDC.